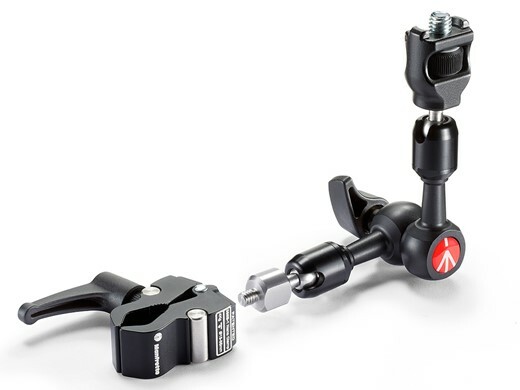 Manfrotto has announced a new series of friction arms and associated accessories. They’re designed to allow photographers to attach lights, extra cameras and accessories to tripods and, via a clamp, to table tops and other rigid edges. The four arms come in two ‘small’ sizes: 5.5in and 9in (15cm and 24cm) and all feature removable ends that accept adapters for spigots, hot shoe flash units, standard tripod threads, heads and clamps. Manfrotto has also introduced an anti-rotation adapter that helps to prevent shift in joined products when used with the Nano Clamp 386B-1 and with the company’s Easylink system on the 190 and 055 tripods. The arms feature what Manfrotto calls an ‘ergonomic adjustable knob’ for tightening the joints, and each can manage a maximum load of 6.6lbs/3kg. For more information see the Friction Arms page of the Manfrotto website. Upper Saddle River, N.J. (July 1, 2015) � Manfrotto, a leading global innovator and manufacturer of premium photo, video and lighting support products, has added to its extensive range of accessories for photographers and videographers with the launch of a new series of friction arms. Designed for enthusiasts and professionals alike, the range comprises four new small-sized friction arms available in two sizes, 5.5 and 9 inch (15cm and 24 cm). The new arms include updated features and are extremely versatile thanks to interchangeable adapters. All models are designed and manufactured in Italy, with the Manfrotto quality that photographers and videographers know and trust. With the series, Manfrotto introduces an innovative anti-rotation system to prevent the load from rotating. This distinctive feature is available using Manfrotto friction arms in combination with Manfrotto Nano Clamp 386B-1 and with the �Easylink� connection of the Manfrotto 190 and Manfrotto 055 tripod series. As a result of the unique shape of the anti-rotation adapter, the metal ring, the arm, the equipment and the support or clamp are interlocked, preventing unwanted movement and rotation. Manufactured using high-quality aluminum, the new friction arms are durable and can carry a payload up to 6.6 lbs. The arms offer superior performance as a result of the ergonomic adjustable knob, which allows for maximum torque when securing the arm in place. Furthermore, at the end of each new friction arm, users will find an adapter that can be easily swapped for various applications. The adapters available include a 5/8� spigot, 3/8� and 1/4� attachment, a hot-shoe attachment, and of course, Manfrotto�s anti-rotation adapter. All of the new friction arms feature a 5-year warranty upon registration on the Manfrotto website.